I am deeply saddened to announce that my father passed over on May 23rd, 2017. Iwant to celebrate his life for he was the strongest and most important man in my life. He is the solid foundation of 3 generations. His memory will live on thru his family. He taught me to follow my heart, and with determination and perseverence i can accomplish anythng. He will be greatly missed by many, but never forgotten. He lived a full life and left his life acceptibg what his God had his Hand upon, and crossed over peacefully. Healgrief has a memorial to share with you. 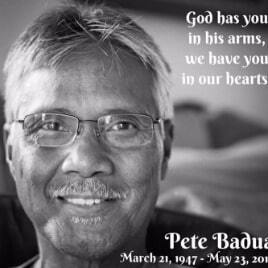 https://healgrief.org/pete-badua/ We invite you to express condolences, share special memories and photos and light virtual candles to honor and celebrate the life of our loved one. We also invite you to share this with others who may want to be notified as well. You may do so by sharing the link or by clicking the “Share this Memorial” button from within the memorial itself.